Tim Bolick addreses school board members regarding the issue of decreasing certain service personnel contracts by five days. 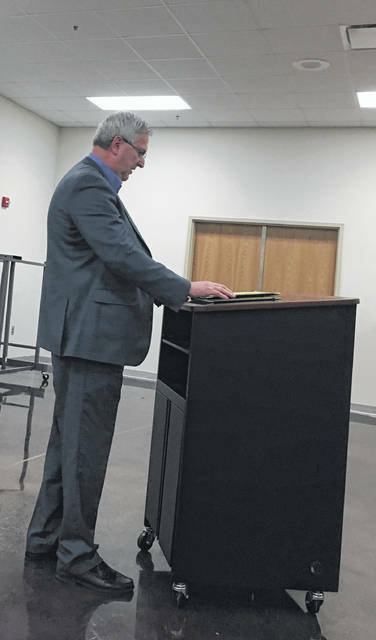 POINT PLEASANT — The Mason County Board of Education met this week for a regular business meeting, voting on RIF (Reduction in Force) and transfer issues. Tim Bolick, field staff representative for Mason County/benefit program specialist at West Virginia School Service Personnel Association, addressed the board members regarding the issue of decreasing certain service personnel contracts by five days in accordance with West Virginia Code 18-A-2-2. Bolick explained in regards to the five day contract cuts, chosen service personnel employees would lose approximately $500 from their annual pay and are already the lower paid of the employees within the school system. “Money is black and white, morale makes an impact,” said Bolick. Billings made a motion to go into executive session at 6:19 p.m. for the purpose of discussing the RIF and transfers, the motion was seconded by Tennant, and all board members approved. Billings made a motion to come into regular session at 7:22 p.m., the motion was seconded by Cossin, and all board members approved. The placement of 10 professional personnel on the Professional Personnel on Transfer and Subsequent Assignment list, in accordance with WV Code 18A-2-7, effective at the end of the 2018-19 school year. The contracts of 42 Service Personnel employees, in accordance with WV Code 18A-2-2, be terminated due to Reduction In Force (to decrease contracts by 5 days) list, effective at the end of the 2018-19 school year. The contracts of 23 Service Personnel employees, in accordance with WV Code 18A-2-2, be terminated due to Reduction In Force, effective at the end of the 2018/19 school year. Cullen explained since several of the service personnel for Mason County School System contracts were over 200 days, days from certain service personnel contracts could be reduced and save up days to eliminate positions to come off the state formula. Cullen reported RIF and Transfer letters were sent out on Feb. 21, RIF and Transfer first round of hearings were held on March 11, and Cullen and the board members have until April 1 to notify employees of potential RIF’s and Transfers for the next school year. Final board approval must be done by May 1. Cameron Moffett, maintenance director, was in attendance to discuss the SBA/HVAC control updates on Hannan Junior/Senior High School and New Haven Elementary. Cossin made a motion for the board to approve the following changes to the current 2018-19 school calendar due to two work-stoppage days: change May 30 and May 31 to instructional days. Change June 3 to a “P” (preparation for opening/closing schools) day. The motion was seconded by Tennant and all board members approved. Billings made a motion to change the funding source from 20 percent to 15 percent ($72, 424.65) and from Excess Levy Funds from 80 percent to 85 percent ($410,406.35) on the bid provided by Advantage Technology of Charleston to install E-Rate Category 2 eligible upgrades to the school system’s internet at the cost of $482,831. Cossin seconded the motion and the board members approved. Billings made a motion to accept the amended motion (10.02) to approve the bid provided by Advantage Technology of Charleston to install E-Rate Category 2 eligible upgrades o the school system’s internet at the cost of $482,831. Funding sources will be 15 percent ($72, 424.65) from Excess Levy Funds and 85 percent ($410,406.35) from E-Rate funds directly to the vendor. Cossin seconded the motion and the board members approved. Cullen reported an Education in Reform question and answer style meeting will be held on April 11 from 6-8 p.m. at the Mason County Board of Education Office. Should the number of those attending max the capacity, the meeting will be moved to Point Pleasant Junior/Senior High School. The West Virginia Board Association is interested in bringing the boards together to discuss Education in Reform, a meeting will be held in Logan on May 15. More on the Mason County Board of Education meeting will appear in an upcoming edition of the Point Pleasant Register.